Paderborn-based thrash brigade Gods Will Be Done got a lot positive feedback for their first demo and raving reviews in many zines. Their brutal mix of Exodus, Pantera, Slayer and Machine Head is peppered up with modern sounds, but never crosses the border to metalcore. It took them quite awhile to find a label, but finally they inked a deal with Stargazer Records. 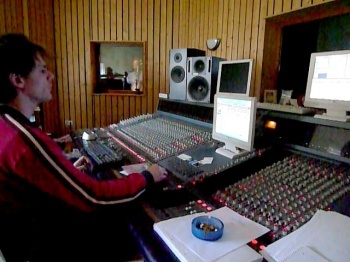 Within 6 days they recorded their debut The Book Of Blood at Westwood Recording Studios with Malte Rinkens turning the knobs. Gods Will Be Done are singer Gulle, bassist Holger Parzich, guitarists Adam Harding and Kasper and the lately returned drummer Weiland. For May 2nd they invited some media people and friends for a pre-listening party at Westwood Recording Studio. 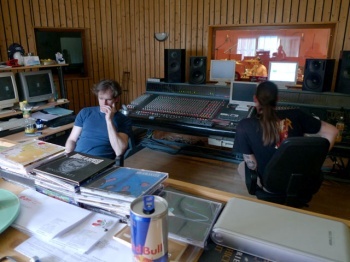 Bassist Holger took the chance to speak some introducing words and pointed out who smoothly the records been and that the recordings with producer and studio owner Malte couldn't have been any better. Rinkens' did an excellent job and the fantastic sound of the album is essential for the final result, but that he also helped the band with his ideas. Sure, they won't follow every line, but some structural ideas were welcome. Holger emphasizes that the band didn't want some sterile sound, no over-produced album. That they were going for some brutal, earthy album which every band member was 100% satisfied with. "The drums aren't triggered and done in one take - pure and without any effects. Same can be said about every other instrument!" states Holger again to make his point. And then they played the full album on high volume for us. And after the intro the songs were going full force. The word massive popped up when I heard the songs The Mark Of Cain first. Very massive and powerful! But still balanced so that every instrument got enough space. Bass and guitars are equal which adds up to the massive and brutal sound. Singer Gulle has worked on his performance and his shouts are deeper and more emotional compared to the demo. With all 12 tracks are they take a bow to the thrash metal heroes which they combine with the freshness of the younger generation. Old school, but not back-dated. Two songs of their demo - Lamb Of Sacrifice and Eat Your Whole - were re-recorded and sound now more aggressive and to the point compared with the demo recordings. Okay, after listening for the first time you can't judge the songs fully, but I think that there is something brutal coming for us. Guys, well done! Talking about the lyrics of Gods Will Be Done I have to introduce their 6th band member Reggie Jones! This guy writes the lyrics from the guidelines of the band. The Wales-born Jones knows perfectly who to put the words Gulle has to intone. Even if it isn't a concept album, so there is a red fathom tieing the songs together. Mainly it's about secularized and parochial religions and as you expect they aren't talking nicely about Christianity, Islam and other religious organizations. And if you take a look at the artwork you'll find it well visualized. Cover designer Chris Salem (Combat Color) and lyricist Reggie Jones were present at the pre-listening party. After the listening session everybody involved was proud of what they achieved with this release - and there is nothing wrong about that. One spin isn't enough to make a final judgement, but one thing's for sure, be aware of this thrasher! This debut album will leave it's mark! So make a note about Gods Will Be Done and don't miss the album when it get's in stores in a few weeks!